NSS Labs performed an independent test of the Cisco ASA 5585-X SSP60 v5.3.1. 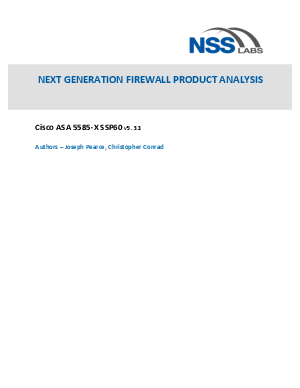 The product was subjected to thorough testing at the NSS facility in Austin, Texas, based on the Next Generation Firewall methodology v5.4 available on nsslabs.com. Using the recommended policy, the ASA 5585---X SSP60 blocked 99.5% of attacks against server applications, 99.0% of attacks against client applications, and 99.2% overall. The device proved effective against all evasion techniques tested. The device also passed stability and reliability tests.